This webinar showcases how four different educational institutions across the U.S. are using PIPE to identify equity gaps, explore root causes, and implement evidence- and research-based strategies to close gaps in the participation and completion of students in CTE/STEM programs of study. NAPE’s Program Improvement Process for Equity (PIPE) provides secondary and postsecondary teams of educators with a powerful process to identify equity gaps in the participation and completion of students in CTE/STEM programs of study by gender, race and ethnicity, and special population status; equips them with tools to conduct meaningful action research to explore the “root causes” for those gaps; and provides mechanisms to identify and implement evidence- and research-based strategies to close those gaps. Join this interactive webinar to learn how the College of Southern Nevada is using action research to understand and address participation gaps in CTE STEM programs of study; how Vantage Career Center in Ohio and Roseburg High School in Oregon are effectively recruiting and retaining girls in Manufacturing and other nontraditional STEM pathways; and how Cedar Rapids Community Schools is integrating the Intercultural Development Inventory (IDI) with PIPE to help educators to identify and address implicit biases that create barriers to students’ success in CTE. 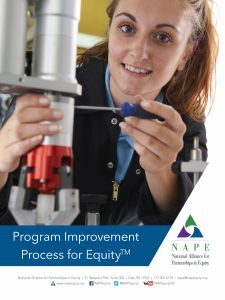 Learn the components of NAPE’s Program Improvement Process for Equity (PIPE) to identify and address equity gaps in the participation and completion of students in CTE and STEM nontraditional career preparation programs.